All cells in the body contain the same DNA code in their nucleus, right? Not so much. In the brain there seems to be a variety of DNA codes represented, according to new research out of the Salk Institute. 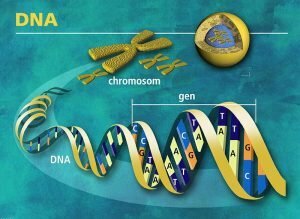 LA JOLLA, CA—It was once thought that each cell in a person's body possesses the same DNA code and that the particular way the genome is read imparts cell function and defines the individual. For many cell types in our bodies, however, that is an oversimplification. Studies of neuronal genomes published in the past decade have turned up extra or missing chromosomes, or pieces of DNA that can copy and paste themselves throughout the genomes. The only way to know for sure that neurons from the same person harbor unique DNA is by profiling the genomes of single cells instead of bulk cell populations, the latter of which produce an average. Now, using single-cell sequencing, Salk Institute researchers and their collaborators have shown that the genomic structures of individual neurons differ from each other even more than expected. The findings were published November 1, 2013, in Science. Left to right: Ira Hall, University of Virginia, Michael McConnell, University of Virginia, and Fred H. Gage, Professor, Laboratory of Genetics, Salk Institute for Biological Studies. "Contrary to what we once thought, the genetic makeup of neurons in the brain aren't identical, but are made up of a patchwork of DNA," says corresponding author Fred Gage, Salk's Vi and John Adler Chair for Research on Age-Related Neurodegenerative Disease. In the study, led by Mike McConnell, a former junior fellow in the Crick-Jacobs Center for Theoretical and Computational Biology at the Salk, researchers isolated about 100 neurons from three people posthumously. The scientists took a high-level view of the entire genome—looking for large deletions and duplications of DNA called copy number variations or CNVs—and found that as many as 41 percent of neurons had at least one unique, massive CNV that arose spontaneously, meaning it wasn't passed down from a parent. The CNVs are spread throughout the genome, the team found. The miniscule amount of DNA in a single cell has to be chemically amplified many times before it can be sequenced. This process is technically challenging, so the team spent a year ruling out potential sources of error in the process. "A good bit of our study was doing control experiments to show that this is not an artifact," says Gage. "We had to do that because this was such a surprise—finding out that individual neurons in your brain have different DNA content." The group found a similar amount of variability in CNVs within individual neurons derived from the skin cells of three healthy people. Scientists routinely use such induced pluripotent stem cells (iPSCs) to study living neurons in a culture dish. Because iPSCs are derived from single skin cells, one might expect their genomes to be the same. "The surprising thing is that they're not," says Gage. "There are quite a few unique deletions and amplifications in the genomes of neurons derived from one iPSC line." Interestingly, the skin cells themselves are genetically different, though not nearly as much as the neurons. This finding, along with the fact that the neurons had unique CNVs, suggests that the genetic changes occur later in development and are not inherited from parents or passed to offspring. It makes sense that neurons have more diverse genomes than skin cells do, says McConnell, who is now an assistant professor of biochemistry and molecular genetics at the University of Virginia School of Medicine in Charlottesville. "The thing about neurons is that, unlike skin cells, they don't turn over, and they interact with each other," he says. "They form these big complex circuits, where one cell that has CNVs that make it different can potentially have network-wide influence in a brain." Spontaneously occurring CNVs have also been linked to risk for brain disorders such as schizophrenia and autism, but those studies usually pool many blood cells. As a result, the CNVs uncovered in those studies affect many if not all cells, which suggests that they arise early in development. The purpose of CNVs in the healthy brain is still unclear, but researchers have some ideas. The modifications might help people adapt to new surroundings encountered over a lifetime, or they might help us survive a massive viral infection. The scientists are working out ways to alter genomic variability in iPSC-derived neurons and challenge them in specific ways in the culture dish. Cells with different genomes probably produce unique RNA and then proteins. However, for now, only one sequencing technology can be applied to a single cell. "If and when more than one method can be applied to a cell, we will be able to see whether cells with different genomes have different transcriptomes (the collection of all the RNA in a cell) in predictable ways," says McConnell. In addition, it will be necessary to sequence many more cells, and in particular, more cell types, notes corresponding author Ira Hall, an associate professor of biochemistry and molecular genetics at the University of Virginia. "There's a lot more work to do to really understand to what level we think the things we've found are neuron-specific or associated with different parameters like age or genotype," he says. Other authors on the study are Michael Lindberg and Svetlana Shumilina of the Department of Biochemistry and Molecular Genetics at the University of Virginia School of Medicine; Kristen Brennand, now at the Icahn School of Medicine at Mount Sinai in New York; Julia Piper, now at Harvard University in Cambridge, Massachusetts; Thierry Voet and Joris Vermeesch of the Center for Human Genetics, KU Leuven, Leuven, Belgium; Chris Cowing-Zitron of Salk's Laboratory of Genetics; and Roger Lasken of the J. Craig Venter Institute in San Diego. This work was supported by the Crick-Jacobs Center for Theoretical and Computational Biology, the G. Harold & Leila Y. Mathers Foundation, the National Institutes of Health, the Leona M. and Harry B. Helmsley Charitable Trust, the JPB Foundation, and the Burroughs Wellcome Fund.